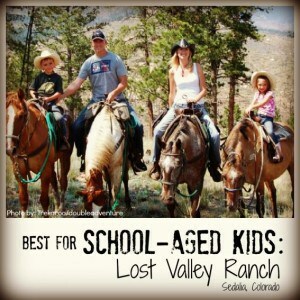 Trekaroo spent 2012 reviewing the best family dude ranch vacations across the country (it was a hard job, but someone had to do it!) We are excited to provide you with this handy guide to our favorite ranches and why they are so special as family friendly vacation getaways. Whether you are a novice rider with toddlers in tow, to a galloping thrill seeker with great food and diverse amenities in mind, we’ve got the best family dude ranch vacation for you! Horseback riding is spectacular through the pine forests in Montana (kids 6 and up), but what makes this place stand out is the lakefront activities. My boys raced to jump into a kayak around the island; they bravely tried waterskiing and wakeboarding. Sailing, swimming, paddleboarding, fishing, and more were enjoyed by guests all afternoon long. Families will love the freedom to let their kids enjoy a multitude of activities and will have lots of fun stories to tell of their adventures in the historic lodge each evening with a view of the sunset over Flathead Lake. 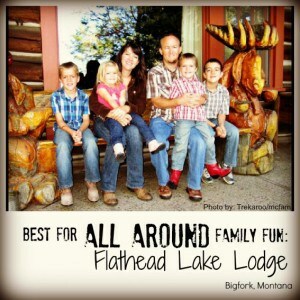 GIVEAWAY: Enter to win a week at Flathead Lake Lodge! 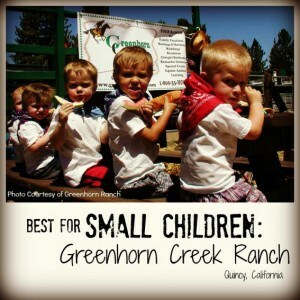 Greenhorn Creek Ranch ranch is perfect for families with young kids. During the summer, they offer a program for the little ones at the Kiddie Coral (Infant to 5 year olds). While mom, dad and older siblings are off on trail rides, the little ones are having fun taking pony rides, doing arts and crafts, petting farm animals, playing old fashion ranch games, and enjoying the beautiful grass lawn by the fishing pond. The friendly staff made our 3 year old feel so special he barely missed us. Greenhorn Creek Guest Ranch is the closest guest ranch to the San Francisco Bay Area. Get ready to enjoy some amazing food and fun activities at The Home Ranch, geared for families with kids ages 6 and up. The celebrated Haute Mountain Cuisine gets guests ready for breathtaking hikes, daily trail rides, and relaxing spa treatments. Kid counselors are on hand daily to help kids have amazing adventures or to give parents some free time, and families love the experience! Looking for more info on The Home Ranch? Trekaroo has you covered. EXCLUSIVE DEAL: Book 4 nts get the 5th FREE! The scenery of the Lake George Area is stunning, the riding lots of fun, and the food is delicious. But what stands out most about Tarryall River Ranch is the warmth of the staff. At this small, family run ranch, you feel like you’re now part a large happy family. From the housekeeping, to the dining service, to the wrangler staff, you won’t find a more friendly, genuine, and attentive staff who is ready to consider your every need. And if you’re nervous about square dancing, you will feel a lightness in your step when one of those dashing ranch interns sweeps you off your feet. 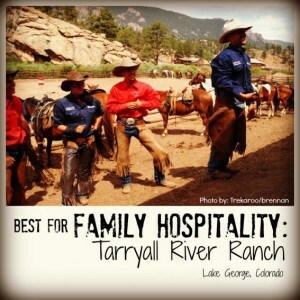 Read our detailed review of Tarryall River Ranch. If you’re all hat and no cattle, Majestic Dude Ranch might just be the ideal place to step in to a cowboy role. This ranch offers some of the best wranglers west of the Mississippi, as well as millions of acres of pristine mountain wilderness and backwoods trails at your beck and call. Evenings at Majestic Dude Ranch are designed for families, with activities ranging from outdoor movies, line dancing, dodge ball, tipi campouts, cowboy poetry, and s’mores. Majestic Dude Ranch also lays claim as the only dude ranch which sports its own field of dreams baseball diamond. 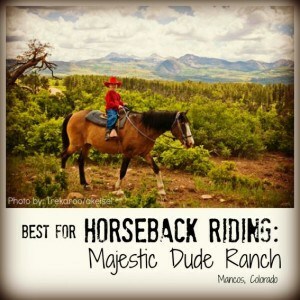 Explore detailed reviews of Majestic Dude Ranch. EXCLUSIVE DEAL: Save 20% off your stay. Vista Verde Ranch allows families to cowboy up in style while living in the lap of luxury. Accommodations consist of lavish cabins surrounded by awe inspiring views of the Rocky Mountains amidst pastures full of champion quarter horses. Summer activities include biking, rock climbing, and fishing, whereas winter activities include skiing, snowshoeing, and sledding. Vista Verde Ranch is defined by its luxury and personal service. Who knew living the life of a cowboy could be so indulgent? 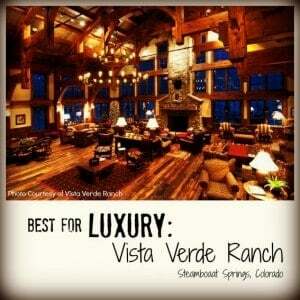 Explore detailed reviews of Vista Verde Ranch. Explore more kid-friendly reasons to visit Lost Valley Ranch. 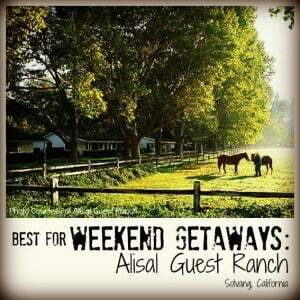 Tips and Tricks for enjoying your stay at Alisal Guest Ranch. White Stallion Guest Ranch guest ranch is perfect for families to enjoy activities together. There are many options for horseback riding for kids 5 and up including slow rides, fast rides, and breakfast cookout rides. The desert summer sun makes off-peak travel a major perk although plenty of other activities including a swimming pool will give families the chance to have fun together whether it is a cool winter day or a hot summer afternoon. Bonus: Kids five and under are free! 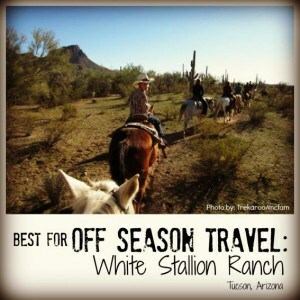 Read our handy guide to everything White Stallion Guest Ranch. Be as cowboy as you want to be!! You are in charge of your experience at Rankin Ranch! Whether you take advantage of the two ride times offered each day or relax by the pool is up to you. You can ride with your kids or an all adult group, there is a great kids’ program to keep the youngsters busy. There is also fishing, archery, and scheduled activities such as games, the Rankin Olympics, evening patio parties, and a nightly after dinner walk to feed the farm animals. Try everything, do nothing, it’s up to you. The hospitality at this ranch is tremendous! 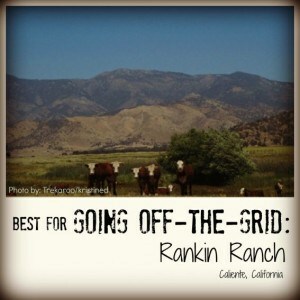 Learn why Rankin Ranch rates so well with Trekaroo families. Lone Mountain Ranch is open year round, welcoming families in the summer for horseback riding and in the winter for cross-country skiing. The setting of the Ranch is what I imagine Heaven to be like. While the fly fishing and white water rafting is renowned, it is the exceptional outdoor youth program that caught our attention. 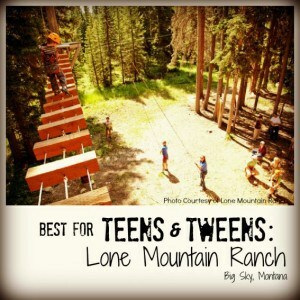 Your tweens & teens won’t just be playing cowboy and cowgirl; they’ll love the high ropes course, archery, backcountry survival and animal tracking workshops…the fun seems endless. Explore more family fun at Lone Mountain Ranch. 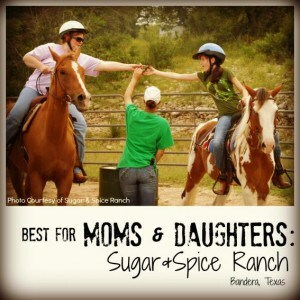 Cowgirls and their moms will spend an unforgettable week together learning to groom, tackle, feed, and ride horses on a ranch in Texas. The bonding of moms and daughters is fostered through the enjoyment of taking care of horses and swimming together. Cowgirls, and cowboys also, are invited to ride the open range with Miss Leigh through the beautiful open spaces of Wyoming for a week vacation that you won’t forget. Most guest ranches are set in a beautiful location, but you will be amazed at the breathtaking views of the Sangre de Cristo Mountain range in Colorado as you join the ranchers of this Nature Conservancy. Guests are invited to ride through and learn about a conservation herd of 2,000 bison, integrate themselves into daily life on the ranch, participate in extensive nature programs, as well as enjoying fly-fishing and white water rafting. 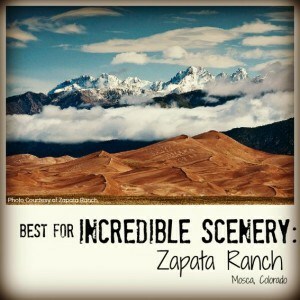 See the amazing scenery on your next vacation at Zapata Ranch. 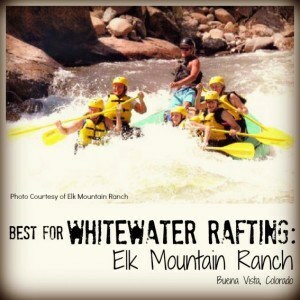 Families will experience a one-week adventure at this Colorado ranch set in the heart of the “White Water Capital of Colorado.” Each day holds fun activities including horseback riding, white water rafting, fishing, and supervised activities for kids. It’s a family-oriented guest ranch that everyone will love. Find out more about Elk Mountain Ranch. Disclosure: This series is sponsored by Top50Ranches, the leading resource for travelers seeking ranch vacations, Flathead Lake Lodge, Tarryall River Ranch, Majestic Dude Ranch, Zapata Ranch, The Sugar & Spice Ranch, The Home Ranch, Elk Mountain Ranch, and Greenhorn Creek Guest Ranch. 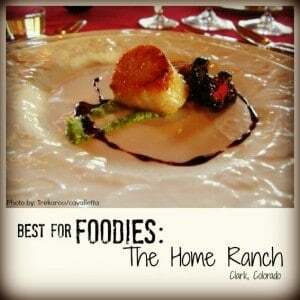 A dude ranch for FOODIES?!?! sign me up! a friend of mine went to a dude ranch in AZ a few years ago and had an amazing time. thanks for the overview – who knew that there were so many to choose from!